I know how hard it is for our moms to prepare our meal. Specialy those mom who have kids who doesn’t want their meal to be a “repeat performance” of their previous dish. I can relate to that because I am like that. I don’t want to eat the same dish twice on the same day. It’s not necessarily mean you have cook fish for lunch and pork for dinner. Maybe a twist of the previous dish will somewhat give life to the dish. We have to admit that we Filipino loves our food and like today, I’m sure some of us prepared dishes way more we can eat it, right? What we would normally do is to reheat these leftovers and, well, it’s hot again. Sometimes, It’s really difficult for the moms to feed their kids with the same dish on the same day, right? But, if you serve this dish with a different presentation, you will be amazed how your kids will devour the food. Maybe instead of serving a boring mayo-based sandwich to your kids, try to shape the bread into a cat or dog using a cookie cutter and the kids would consume it happily and would even ask for more. Moms should be creative if you want to feed your child the same dish. Okay moms, when I say creative, I mean creative. Don’t feed you child with a bamboo stick on your left hand, that’s not creative. Kidding a side, I cooked Beef Caldereta for our lunch today. Doing nothing in this hot weather makes me hungry from time to time compared with working. I want to cook something but felt lazy because of the weather. Initially I decided just to simply sandwich those beef from the caldereta between bread but an idea struck me, bread roll. I realized I still have some sour cream in the fridge and yes, this is it. Bread roll stuffed with beef caldereta dipped in sour cream dipping sauce. I can now imagine how the two would compliment each other. Can you imagine the spicy savory flavor coming from the beef caldereta will be balance by the cool tangy sour cream? Mouthwatering right? For this snack, you can use any kind of meat. For this bread roll I used meat from beef caldereta. I bet meat from pork menudo would also be good. Feel free to some cheese if you want. I think the kids would love that also. You can also brush the bread roll with melted butter if you want too. Be creative, you’ll be the one to eat it anyway. 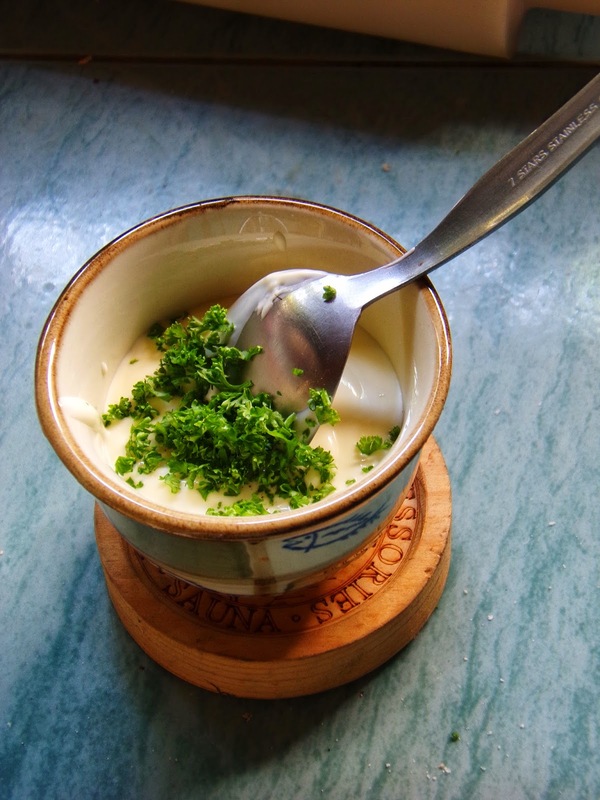 Combine sour cream and parsley and set a side. Preheat oven at 200 degrees Celsius. Remove the brown edges of the tasty bread. 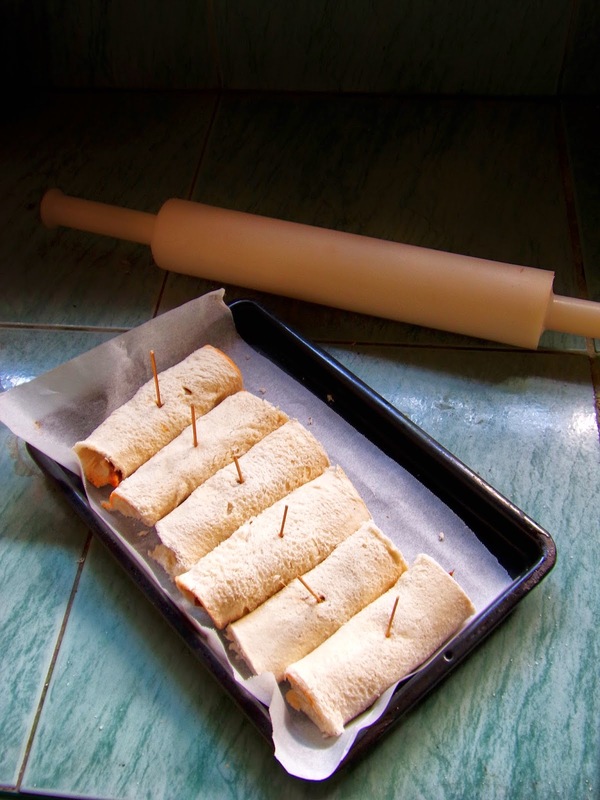 Flatten the bread using a rolling pin. Add the meat on one side of the bread. 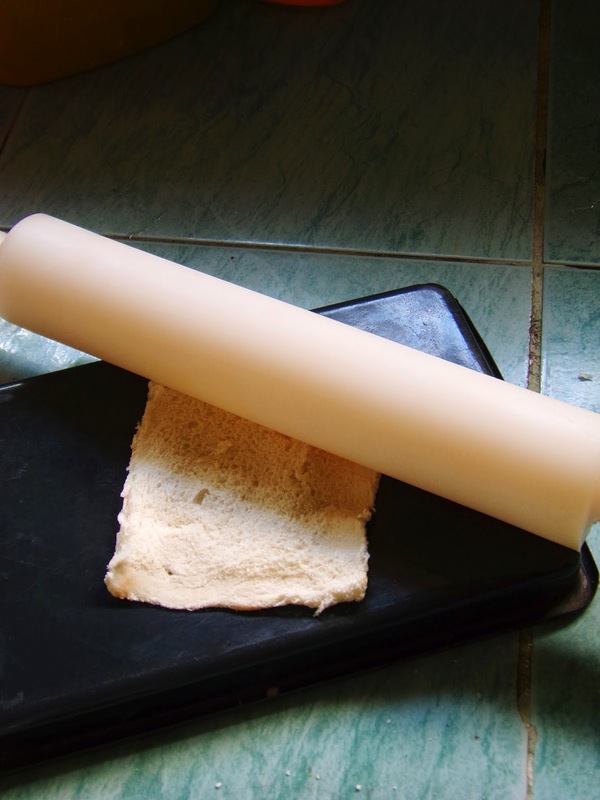 Roll the bread and seal it using a toothpick. Bake in the oven for 10 minutes or until golden brown. Served with sour cream dipping sauce.